Whenever a creator tries to make something heartwarming, there's always a danger of over-reaching and ending up with something trite and sappy and instead. Sometimes striking the perfect balance seems nigh-impossible, but among other things, Kiyohiko Azuma's popular Yotsuba&! manga proves that it can be done. Chronicling the life of an energetic four-year-old girl named Yotsuba, whose name means "four-leaf" (as in four-leaf clover), Azuma manages to consistently channel the joy of discovering the world through the eyes of a child throughout this long-running series' many volumes. While Yotsuba has a flair for getting into trouble that's all her own, readers will no doubt find that some of her adventures rekindle memories of their own childhoods. Rather than just being able to draw children and write their dialogue, Azuma clearly remembers what it's like to be a child in great detail, and that ability is surprisingly rare. The artist was already going this route with his previous smash hit Azumanga Daioh!, which features teen girls on the cusp of womanhood. While in that series, the humor often derived from the fact that the girls were in an indeterminate state between childhood and adulthood, in Yotsuba&!, Azuma sharpened his ability to find the humor in the mundane and zeroed in on all the things he does particularly well as an artist. Yotsuba&! is also a bit grittier than AzuDai, if a series about a four-year-old can really be said to be gritty. Despite the emphasis on childhood discoveries, the manga does not take place in a bright and happy world full of sunshine: we learn early in the series that Yotsuba was an orphan taken in by a well-meaning stranger (now her father, Mr. Koiwai), and the whole manga has a very working-class feel to it. Yotsuba's world of telephone poles, small houses and bicycles is more functional than idyllic, and scenes of traditional beauty are rare. 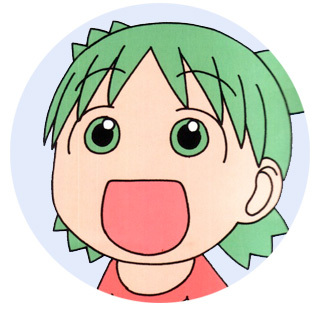 However, this is all a part of what makes Yotsuba&! work so well. It's not about finding happiness in an idyllic, perfect world designed to comfort children. It's a series about a child that's mostly for adults, about finding the joy in the world we have, not the one we want. Other than the titular character, the title is filled with likable folks. The Ayase family, the Koiwais next-door neighbors, are refreshingly realistic, whose three sisters of different ages all relate to Yotsuba at different levels. Fuka, the second lead who becomes a surrogate big sister to Yotsuba, seems like someone who really might live next door to you, while her sisters make their own contributions. Koiwai himself is something of a mystery: Where did he find Yotsuba? Why did he take her in? And why has no one yet called child services on him when his response to Yotsuba running off on her own is "Yeah, she does that?" It probably goes without saying that Yotsuba is adorable, although it's her unbridled enthusiasm that makes her cute as much as Azuma's drawing style. In general, the cartoony characters really pop off of the realistic backgrounds, and comedic exaggeration is done enough to be funny without going overboard. Even if you forget about the characters for a minute (although this title makes it hard), Yotsuba&! is just a really well-drawn manga, period. Azuma is a master storyteller at the height of his craft. Furthermore, if you're someone who isn't touched by this title (because we have to assume that such people exist), the fact remains that the manga is just plain funny. Sometimes the humor is of the goofy physical variety, while other times it's more subtle, but it's always charming. Could we make it any more obvious we're in love with this title? If you haven't read Yotsuba&! yet, please go see about that; you're missing out. If you have a good memory of your childhood, you'll relate to Yotsuba's observations, and if you don't, well- you might find you actually remember more than you think. Yotsuba&! is available from Yen Press. Below: Panels from the Yotsuba&! manga. Below: Manga ilustrations for Yotsuba&!.